Instrument with a steel wheel containing several rows of regular asperities and used to create coarse-grained lines. Steel rod used to engrave a figure in copper by biting into the plate or the varnish covering it. Instrument used to refine the cuts and remove irregularities from the metal. Copper is the metal most often used in engraving because it is strong, is malleable enough for engraving and reacts to chemicals. 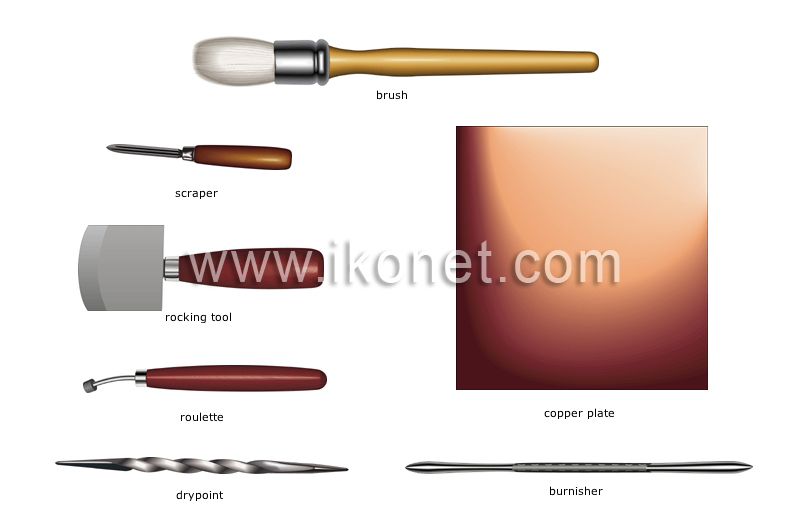 Natural or synthetic bristles attached to a handle, used for spreading paint, varnish or stain on a base. Tool with a thick rounded beveled steel blade; the row of vertical grooves on its sides gives the copper surface a uniform grain. Tool with a pointed triangular blade used to remove burrs, thin strips of copper left on the edge of the groove made by the drypoint.